It’s the last day of vacation, and the flight home is just hours away. Will that final lap through the gift shop offer something that carries the memory of a special place? It’s doubtful: The standard assortment of mass-produced key chains, mugs and trinkets is more likely to fall short. But in the heart of Bristol Bay, a BBNC subsidiary has set out to transform the superficiality of souvenir shopping into an authentic experience that supports and celebrates Native art. At BBNC’s Mission Lodge, travelers are drawn from all corners of the world by the lure of great fly-out fishing and first-class accommodations. Situated on the shores of Lake Aleknagik, steeped in history that reflects both Native and western culture, the Lodge offers its guests what is widely acknowledged to be the best fishing of their lives. Add to that distinction Mission Lodge’s reputation for great hiking, fine dining, spa services, and helpful staff, and you get an unforgettable Bristol Bay experience. But scanning the inventory at Mission Lodge’s gift shop, general manager Sarah Fullhart felt something was missing. While cozy fleece and rugged outdoor gear is the outfit of choice in a place like Mission Lodge, Fullhart saw an opportunity for visitors to take home another aspect of their experience in Bristol Bay. If Mission Lodge carried artwork by Native Alaskans, visitors to Bristol Bay could show their appreciation for the cultures of this special part of the world—and Native Alaskan artists would have the chance to share their work. Alaska Native Life was launched in summer of 2015, when an open call went out to BBNC shareholders. “We send out postcards, not really knowing what we’d get back.” But the campaign yielded dozens of submissions from artists working across a range of mediums, from pencil to chalk to digital media. In Fullhart’s words, she and BBNC’s Chief Operating Officer Scott Torrison were “blown away” by the diversity and quality of submissions. It was a good problem to have—there was too much excellent material. 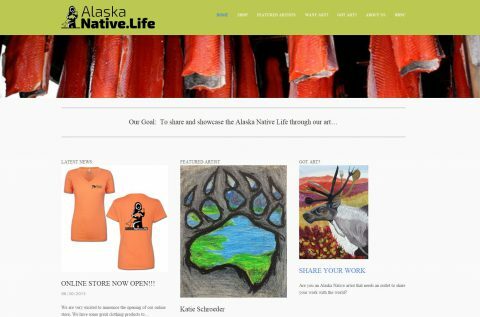 Through a careful selection process, Alaska Native Life narrowed the submissions down to seven designs, now available as t-shirts, hoodies and other products, both at the Mission Lodge gift shop and at the online shop at www.alaskanative.life. For selected artists, Alaska Native Life is an opportunity not only to be paid for their designs, but also to share their heritage through their art. Demand for Alaska Native Life products from Mission Lodge guests has been no surprise—as Fullhart predicted, the current line has sold quickly in the gift shop. But she wasn’t expecting the designs to make such a splash within the Native community of Bristol Bay as well. Friends and family members have snapped up the shirts at farmers’ markets in Dillingham, BBNC corporate meetings and at Beaver Roundup events, showing that local demand is strong for wearable art that expresses Native heritage, culture and creativity. Alaska Native Life’s second campaign will reach BBNC shareholders soon. Reflecting lessons learned during the inaugural run, this year’s call for submissions will emphasize bold, one- or two-color designs that translate well to t-shirts. And although low cost and wear-ability make shirts the perfect product to launch with, Alaska Native Life will soon move past apparel—and beyond the Mission Lodge gift shop—to showcase other forms of Native art. An online marketplace in the works will provide Native artists an Etsy-like platform to sell jewelry, scrimshaw and other artwork and crafts across both traditional and contemporary mediums. Though it’s hard to believe, Alaska Native Life may be the first initiative of its kind in Alaska, illuminating Native culture in a way that attracts the tourist and local communities alike. Given its early success, Fullhart hopes that Alaska Native Life can become a vital network for Native artists in Bristol Bay and beyond. So does BBCNC: As a Native corporation deeply invested in the wellbeing and success of our shareholders, we celebrate the momentum and promise of Alaska Native Life.